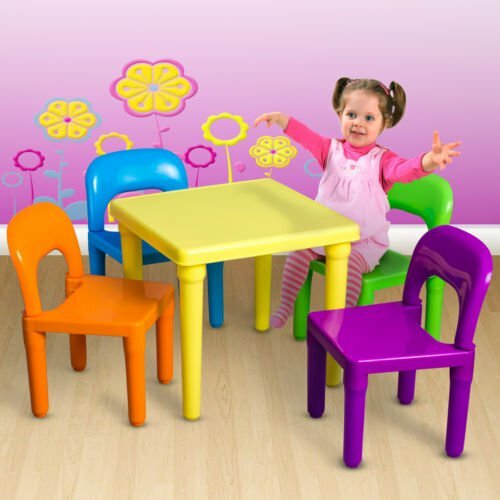 KIDS TABLE AND 4 CHAIR SET: Kids table with 4 chairs perfect for classrooms, playrooms, daycares and schools. 5 FUN COLORS: Multi colored set is perfect for boys & girls and features bright colors that match any room. GREAT FOR CHILDREN 3 & UP (75 lbs. per chair): 10" seat height is perfect for kid's room, classrooms, daycares and playrooms. Use for games or desk. TABLE MEASURES 20 X 20 X 17": Chairs measure 12 inches wide X 11 inches deep with a 18 inch height. If you have any questions about this product by Everything Jingle, contact us by completing and submitting the form below. If you are looking for a specif part number, please include it with your message.